This is a further expansion of our Fabulous label’s already substantial catalogue of collections by artists from the vintage jazz era of the ‘20s and ‘30s. 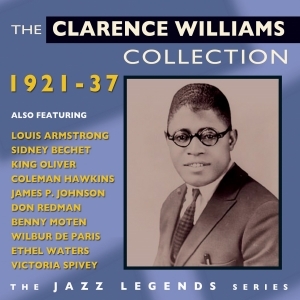 Born in 1893, Clarence Williams was already a veteran of the minstrel shows and the Rampart Street and Storyville vaudeville scene in New Orleans by the time he started recording in the early 20s and had a successful career not only as a pianist and vocalist but also a songwriter, publisher and entrepreneur – he supervised the output of the Okeh label during the ‘20s. He worked with a variety of line-ups and singers, putting together a variety of different ensembles over the years, often featuring major names like Louis Armstrong, Sidney Bechet, King Oliver, Coleman Hawkins, James P. Johnson, Benny Moten and Wilbur de Paris, and working with vocalists like Ethel Waters and Victoria Spivey. This superb-value 50-track 2-CD set selects material from across his most active and influential years, drawing from a variety of his line-ups including the “hot jazz” ensembles and his washboard bands. It is an excellent overview of his career, and demonstrates not only his own skill as a pianist but his influence as a bandleader and writer.